Are you worried about mold infiltrating your tile or pool coping? You should be. Mold can cause a plethora of health issues and easily grows anywhere damp and warm. 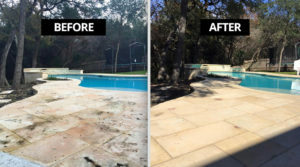 If you have a pool out back, or a patio that is visited frequently by rainfall, you are at risk for experiencing a full-blown mold infection. Water can get in just about every nook and cranny you can think of. While water is not the problem, the issues caused by it can be catastrophic. Let’s take a look at some of the sealants we recommend for preventing mold and what the potential effects are. You want to ensure that you are paying attention so you can avoid the worst of circumstances. Mold can begin to develop anywhere with the right conditions. Anywhere wet and warm is where it starts, like your outside patio or indoor walls. It can develop on top of or under unsealed surfaces. After mold sets in, it will become absolutely necessary for you to have it professionally cleaned and removed. We want to prevent that by looking at some products you can use to seal your tile, stone, floors, patios, decks, and showers. This product is fully designed to prevent discoloring from mold and algae, is a fire retardant, and prevents water entry. It is completely resistant to salt water. That means that this product can keep water from getting into your tile and causing mold to grow, or otherwise corroding it. This sealer is our best aggressive substance repellant. If you are looking to prevent the worst of stains, this is the one to do it. Wine, oil, soil, or food-based products won’t get able to get past this sealant. This could also prevent mold stains. This one is a weatherproofing repellant. That way, you can prevent saltwater erosion and otherwise invasive substances from decimating your natural stone. Porous stone would face the largest threat here, so we recommend this in combination with that kind of surface. Mold is highly toxic because it releases spores into the air and you are forced to breathe it if nearby. The toxins spread by mold can lead to severe respiratory issues and reoccurring migraines, as well as generally declining health. If you have a family, you want to protect them from this infectious substance. Even if you are at home alone, this substance cannot be tolerated. In the case that you need professional mold removal, contact a specialist today. If you are ready to purchase some sealant or have some questions about our prestigious line of products, call (888) 958-0556 to speak with one of our representatives. We can help you prevent mold from growing around or in your home. You can also fill out our contact form at this link. We want to help you maintain your home without having to worry about a mold infestation, and we know that you want the very same thing. Contact us today for more information!